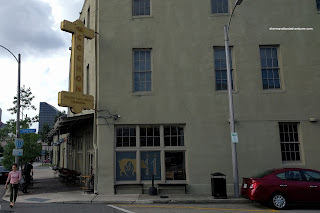 Prior to embarking on our New Orleans food adventure, I did plenty of internet research. From that, I made a list of places to go and narrowed it down since we only had 5 days. No, I'm not like Mijune, who can eat 10 meals a day, so it really had to be a condensed list! However, I did ask her for some recommendations and her list did overlap with mine. One of the spots is Cochon located a block away from our hotel. 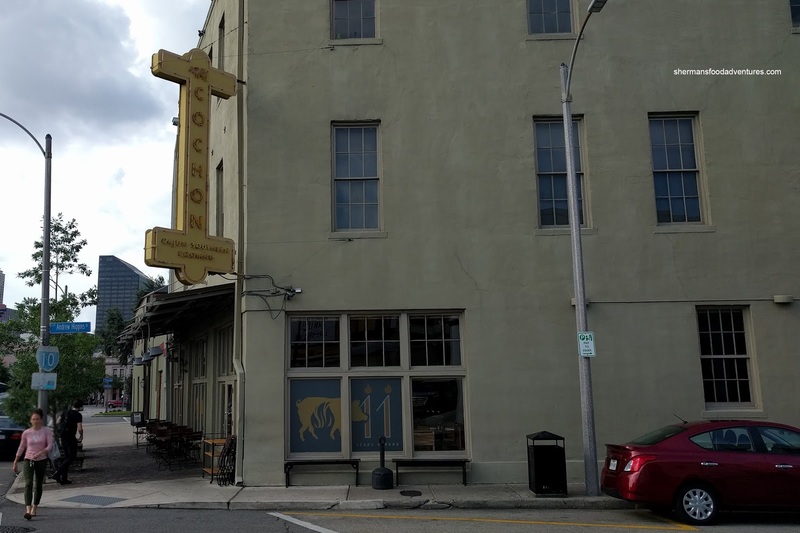 Not only was that a convenient dinner location, it is one of the most recommended spots according to many top 10 lists of places to eat in Nola. We ended up heading there for dinner on our first night. Since Cochon isn't a fancy spot (still classy though), we were able to dress down a bit (yet looking respectable). We went for 2 of the more popular small plates including the awesome Crawfish Pie. 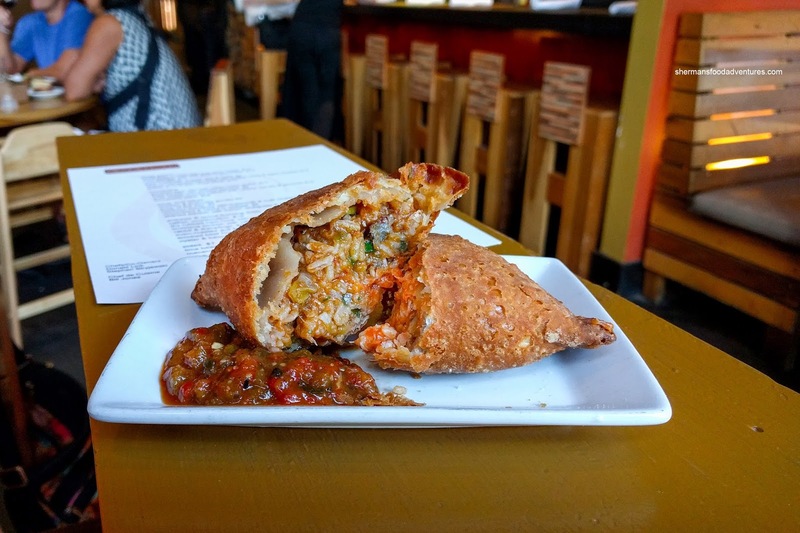 Looking like an overstuffed Jamaican patty, this was flaky and crispy like one, but much more buttery. Inside, the etouffee filling was chock full of briny and Earthy crawfish, rice and veggies. It was noticeably spicy and smoky, but not overwhelming while hits of spices were in abundance. This was super tasty and despite being sinfully rich, I couldn't stop eating it. 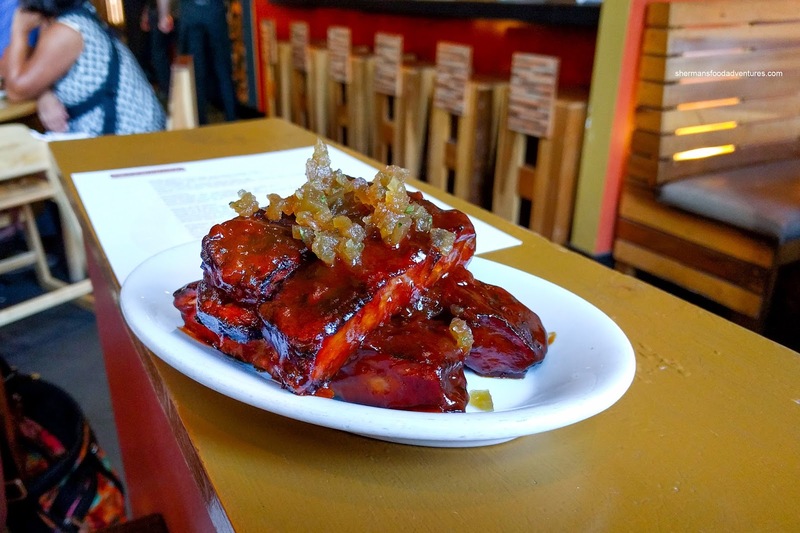 Next up was the Smoked Pork Ribs with watermelon pickle which was equally tasty. These aggressively sauced ribs were tender and meaty while retaining a succulence. They were also smoky and well-seasoned. The sauce was spicy, sweet and tangy with plenty of depth. What really put this over the top was the pickled watermelon rind which was almost like candy being sweet and sticky. 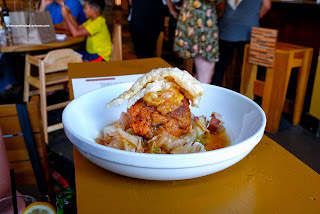 For our mains, I had their signature dish being the Louisiana Cochon with cabbage, cracklings & pickled peaches. In terms of flavour and overall impact, we enjoyed this dish as the meat was full of depth without relying on salt. There was a definitely spiciness that continued to build and linger with each bite. Also, there was a hint of clove and/or star anise that added more body. This was lightened up by the Asian tasting tangy cabbage and daikon underneath. On top, the pickled peaches were sweet and sticky. But the meat itself was a little dry where it didn't create an appealing mouth-feel. 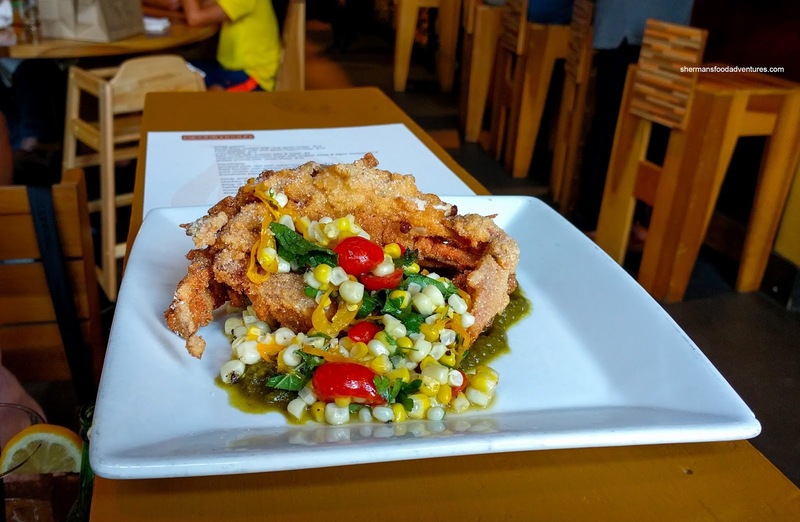 Viv went for one of their features which was the Deep Fried Soft Shell Crab atop tomatillo sauce with a corn salad. This was one large cornmeal crusted soft shell crab. It was crispy on the outside while moist and sweet on the inside. The tomatillo sauce was bright with a slight kick that went well with the crab. The sweet pops of corn were complimented by cilantro, basil and Italian parsley. 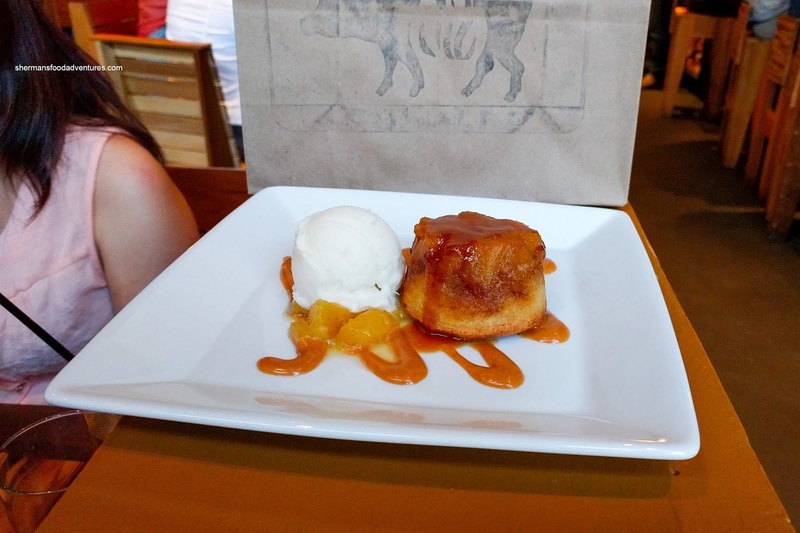 For dessert, we shared the Pineapple Upside Down Cake served with coconut milk lime ice cream and caramel sauce. This was aromatic and buttery where the caramelized pineapples were intensely sweet. Loved the "ice cream" as it was tangy like yogurt but still had the aromatic richness of coconut milk. The texture was more sorbet-like as a result. We thought the sweet caramel sauce was not necessary as the cake was already pretty sweet with the pineapples. Despite the dry pork, we thought Cochon lived up to our expectations at a very reasonable price.